We just returned from our meeting with the neurologist at Gillette and I am nothing but ANGRY! We questioned going through with this procedure. Why? What will it bring us to benefit Roa? Will we get answers that are helpful? Will it show us different methods in our attempts at helping his motor development? Why are we putting him through sediation and spending large amounts of time and energy and money on this procedure? 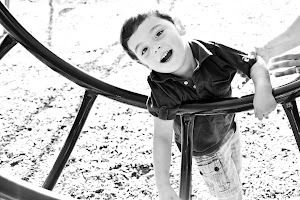 Doctors, therapists, nurses...all told us, "An MRI is a good thing to do to have in his file." It is a good thing to get a picture of his brain so we know what is going on." Once again, I question.... WHY? If this picture of his brain is taken, will you tell us about the wonderful medical advancements of today and HOW YOU CAN HELP MY SON? Will you tell me of new procedures, trial operations, advances in therapeutic studies? Will you tell me of NEW literature you have read on cerebral palsy and how we can CHANGE motor patterns with brain stimulation? We are in the year 2010. You, doctor of neurology for one of the best children's hospitals in the midwest, can sit there.... read the brain scan and say, "We can see that there isn't enough brain matter in the left side of his brain that is affecting motor skills on his right side and overall patterns in general." This most likely happened before birth as a result of an injury. You are going alot of different therapies, that is good. He is such a handsome young man!" WHAT can you tell us to HELP us, Wise Doctor, Giver of Hope? 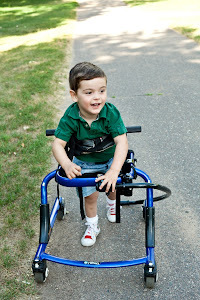 "Based on what I see, he will have difficulty moving on his own and if he doesn't acquire the skills to move on his own, you may some day look at a wheelchair. If the brain injury doesn't allow him to motorically form words, the therapists can help you determine the use of a communication aids." Seriously?? That is why we put our hearts and hopes and dreams on the line? For that little slap of doubt and dash of dreams? Honestly, I think that this doctor is a nice, little old man, who looks at what he learned in 1961 and had not advanced past it. DO NOT LIMIT MY SON! We will continue on our path, showing how much we believe in our Roa and give him EVERY new therapy that is out there. We will continue to research and strive to uncover the NEW things that science can bring. Do not tell us that we don't know if this or that is working because it is still in the research stage. BRING ME TO THE RESEARCH. Let us be a part of it. Do not limit Roa's future. So, we are pretty sure the affects of the botox injections have subsided and we are once again faced with a fussy toddler in the night, waking 3-5 times- uncomfortable and cranky! Our next round of botox is scheduled for March 19th... we wait in much anticipation. The MRI went off without a hitch. Roa handled it well. No reaction to the procedure and anesthesia. AMEN! We were worried parents, but all was well. Roa liked the MRI team, very nice staff at Gillette! They sent us off afterward with a warning of a sleepy low-key boy for the rest of our day. They don't know our Roa. He was drowsy drunk for about 1 hour... then OFF, arching out of my arms and ready to chase those dogs of his! Nuts! He didn't even nap until after 2pm and we got home at 11am! Crazy kid! No rest for us! We get the results on Thursday. We will keep you posted. This afternoon, Roa gets to meet a NEW therapist! Her name is Neue and she is an Anat Baniel Method practioner! She is coming over to just meet us and see if she could help Roa develop and show me some of her techniques. Bryan and I are very excited! We have been playing around with some of the techniques we have watched on the ABM DVD series for parents of children with special needs and Roa has responded well to the natural, gentle movement approach. Details to follow. Gotta run, King Roa has awoke from thy nap! Today was rough. Simply put. Roa was up this morning at 2:00am until 2:20... then from 3:00am until 5:30am!! Bryan is out of town for work, so I was on dog duty at 5:00am sharp when Max and Molly stirred. Roa awoke for the day, as usual, 7:00am. Let's just say, physical therapy with Mary at 8:30 was a welcomed break for Momma, but I wasn't looking or feeling chipper. We also went to the doctor today for a general check up before Roa's MRI on Monday. I am very nervous for the procedure as Roa will be sediated. I know it is routine, but a mother worries. The neurologist has wanted us to complete this MRI since Roa was 6 months, but we have put it off until he was older. Roa will be 19 months on Sunday. I guess it is time. We don't really know what to expect from the results. There is a chance it can find the area of Roa's brain affected. There is a chance that they can find out when the brain damage happened, but that is very slim. There is an equally slim chance that they can find something that is correctable. THAT slim chance is the reason we are going ahead with the MRI. There is also a hope that this MRI can give the doctor some predictions for Roa's futher development. That is scary to think about and yet we hope and pray to hear some positives. Take the time to check this out! Today was an ECFE day and, like a champ, I got us there on time! I have to pat myself on the back for this. Roa was up at 5:00am this giddy and ready to start the day. He finally settle back in at 6:30 and got up for the day at 8:00.- Breakfast, dressed, and off in the truck to school! Roa loves his class. Typical to most kids, he doesn't like to get dressed, but when I mention seeing Ms. Pat and the kids, he perks up! Roa is such an observer. He watches every move the other kids make. He loves playing in the sensory table at school as well as at home. Today they had water and boats. Splashing away! True to each session, I got to go to the parenting component while Pat helps Roa play. We are discussing discipline currently in class and the differing styles and ways of controling behavior. I contribute to the conversation as appropriate, but Bryan and my experience with parenting continues to be so different with Roa. When it was my turn to say how we handle discipline with Roa, I had to honestly say that Roa doesn't "get into things" or cause trouble that needs discipline. He does throw some whopper fits for us centering around meals or desire for Momma or going to bed, but we talk him through them or ignore his tantrum behavior. After my turn, the sweet mom next to me talked about her child and his need for independence. I know she didn't mean it in a negative way, but because she was speaking after me, she used the phrase, "and my son is normal". Not a big deal, just as few simple words- yet they hurt. They reopen that wound in my heart I have been working so hard to keep safe and banaged up at events like ECFE. I know she didn't think of it. I know the other mothers don't think of it when they say in surprise, "Wow, Roa really likes the music!" or "Look at him smile!" I continue to try and educate. Let them know he is "normal". He just doesn't move like little Johnny and Sue! Yet, sometimes,... I am tired and it just stings a little. It's Sunday morning and I feel guilt. I don't think the Thayers will be making it to church today. I feel the Catholic guilt setting in after a childhood and many adult years of getting there every Sunday. I tend to feel that God is an understanding God who know that my heart is there and that sometimes life just creates obstacles that make getting to the actual church for the service is difficult. I lead a life of helping others and prayer. However, I still feel judged. I still feel guilt. One bad thing about a strong Catholic upbringing, I guess. But don't judge me for that last sentence, my Catholic friends. It was a great day yesterday at the Sesame Street LIVE. Roa was mesmerized! Simply stared at the dancing, singing human-sized TV friends. The lights and twinkly stars of the set where the best feature for Roa. I soaked up the energy that radiated from his excited little body. It was pure magic. One we will keep in our memories as our first big family-centered event. Sure, we have taken Roa to the zoo, to the mall, on a fall wagon ride, etc. However this was an event where we had tickets, where we had to be quiet at times and sit. Where getting out to move around was a little bit of a challenge. Where diaper changing, too, was a bit of a treck. Life with Roa has been a challenge and a lessen in parental guilt. Since birth, a simple trip to the store was a gamble. Simply put- Roa was uncomfortable. Uncomfortable in his sweet little body that cramped and arched and ached. Uncomfortable with the sensation of a wet diaper, the bright lights after little sleep, the cold winds of the outdoors. Uncomfortable with reflux that caused him to want to nurse frequently from Momma. It made any trip out of the safety of our home stressful. Honestly, we didn't take him many places. And to this day, I feel guilt for not venturing out on my own more with Roa. Will he arch in my arms and scream? What if he cries the whole time? What will people think? Where will I nurse him or change his diaper? Now that Roa has grown to a 25 pound toddler, managing him alone on an outing is difficult. Especially during Minnesota winter. Sure, you can say use a carrier or a stroller, but if you have met my smart little angel, you know that sometimes those wonderful modes of transporting a baby cause him anger and frustration because he wants to WALK and EXPLORE and do TYPICAL toddler things that his mind tells him to but his body does not allow. So I continue to feel guilt about simply staying home. Today we are staying home from church because we threw a wrench in King Roa's schedule by our Sesame Street outing yesterday. His napping was off, his bedtime altered, his meals didn't go down so smooth. Some people judge, furthering our guilt, and say, "That is just life. Make him learn to deal with an altered day." I was one of those people when I was a teacher working with families of children with special needs. But now,... I live it. I realize that my body aches from being up alot of the night with a fussy boy. I want some sort of normalcy for the rest of our weekend as Bryan and I feel the guilt of passing our active boy off on one another so we can steal a bit of rest for our tired "30-something" bodies. Plus, I don't want to go to church and see the peaceful babies, nestled in mother's arms and the adventurous toddlers chasing toys in the Crying Room or dutifully eating Cheerios as they sit straight and strong in their Daddy's laps. I feel the guilt of envying these Beings of Perfection. Of secretly hating them for their blessings. Do they appreciate what God has given them in that able body? And that is not the thoughts a GOOD mother should have in a House of Worship. So I sit here at my computer and feel the guilt and share in my confession with you. Tomorrow is Sesame Street LIVE at the Target Center! I am pretty excited to see Roa's face as he watches Elmo and Abbie dance in sing up close and personal! We will take many pictures to share the joy! Thanks, Auntie Ellen and Uncle Bill! What a great gift! Today we has Roa's annual IFSP meeting with the school therapists Mary, Laurie and Lindsay, Craniosacral Kim, Courage Andrea and our service coordinator Mercedes from Ramsey County. It was a long meeting! Momma gets a little long winded and involved in questioning and discussing therapy options. Thank goodness Ellen volunteered to come over and hang out with our busy boy so we could both participate in the meeting. We discussed Roa's goals to continue, the progress he has made, and ideas for the next year to come. Beginning in February, Roa will have a new speech therapist, Lindsay, on his case once per month to, hopefully, help us stimulate some spoken words from this kid! We will also do more communication with pictures to start. Bryan and I have started some picture card choices (milk, juice, ball, car....) and Roa is responding well to it. Well, off to bed I go! Tomorrow is a "Sunny day, chasing the blues away. On my way, to where the air is clear....."
Spaghetti Everywhere, But I Don't Care! Roa continues to battle at mealtimes with each little bite. He gets so mad as the spoon nears his mouth yelling and turning away. It is so frustrating for everyone! His coordination abilities have also made it difficult for him to reach his mouth with his hands or an object while seated. Today at lunch, tired of the Screamfest, I just handed him the spoon and put the bowl of mashed (not pureed, yeah!) spaghetti in front of him. With some guidance from me, Roa got the spoon to his mouth without the reflexive head turn!! He looked so very proud and ate the whole bowl! He even got his hands in the dish a few times to explore. Spaghetti everywhere- in my hair, his hair,... and I loved every minute of it! When offering him his sippy cup of rice milk, he grabbed at it and wanted to help! Independent Jo!! My camera battery died, but I will try and post a picture soon! Eat Baby, eat! Tomorrow the Rifton Pacer gait trainer will arrive for Roa's two week trial! Wish us luck. The current gait trainer we have is going ok... not quite the right size and make for Roa, but he does pretty well. The one coming tomorrow is hopefully a better fit and will really get this boy moving! It was a busy weekend with Roa's cousin's, Jay and Jon's birthday party and a bit of shopping with Mom and Dad. Roa is a handful at the mall, let me tell you! He is getting too big to be carried and doesn't want to be in his stroller. Bryan wears him in our carrier and that usually keeps him happy for awhile... until he wants to get down and walk! Through the stores we go, hunched over, helping him walk as he giggles away as if being pursued! Pretty entertaining for the people we meet! We are looking for a new simple umbrella stroller to take for these store trips. A simple one with a 5 point harness and one that will hold Roa for a few years. The one we have now is too small for our big guy! Any ideas? Send them my way! As I blog away, I am curious who is reading my stuff. I would love it if you haven't opened a google account and became an official fan of Rojosjourney that you might do so. I love comments and hearing from people. Makes my time at the computer a little brighter and helps me feel connected. Thanks for raising me up each day. To You, My Sisters Many of you I have never even met face to face, but I've searched you out every day. I've looked for you on the Internet, on playgrounds and in grocery stores. I've become an expert at identifying you. You are well worn. You are stronger than you ever wanted to be. Your words ring experience, experience you culled with your very heart and soul. You are compassionate beyond the expectations of this world. You are my "sisters." We were initiated in neurologist's offices and NICU units, in obstetrician' s offices, in emergency rooms, and during ultrasounds. We were initiated with somber telephone calls, consultations, evaluations, blood tests, x-rays, MRI films, and heart surgeries. We are united, we sisters, regardless of the diversity of our children's special needs. Some of our children undergo chemotherapy. Some need respirators and ventilators. Some are unable to talk, some are unable to walk. Some eat through feeding tubes. Some live in a different world. We do not discriminate against those mothers whose children's needs are not as "special" as our child's. We have mutual respect and empathy for all the women who walk in our shoes. We are knowledgeable. We have educated ourselves with whatever materials we could find. We know "the" specialists in the field. We know "the" neurologists, "the" hospitals, "the" wonder drugs, "the" treatments. We know "the" tests that need to be done, we know "the" degenerative and progressive diseases and we hold our breath while our children are tested for them. Without formal education, we could become board certified in neurology, endocrinology, and undergo. We have coped with holidays. We have found ways to get our physically handicapped children to the neighbors’ front doors on Halloween, and we have found ways to help our deaf children form the words, "trick or treat." We have accepted that our children with sensory dysfunction will never wear velvet or lace on Christmas. We have painted a canvas of lights and a blazing yule log with our words for our blind children. We have pureed turkey on Thanksgiving. We have bought white chocolate bunnies for Easter. And all the while, we have tried to create a festive atmosphere for the rest of our family. We’ve gotten up every morning since our journey began wondering how we’d make it through another day, and gone to bed every evening not sure how we did it. We’ve mourned the fact that we never got to relax and sip red wine in Italy. We’ve mourned the fact that our trip to Holland has required much more baggage than we ever imagined when we first visited the travel agent. And we’ve mourned because we left for the airport without most of the things we needed for the trip. But we, sisters, we keep the faith always. We never stop believing. Our love for our special children and our belief in all that they will achieve in life knows no bounds. We dream of them scoring touchdowns and extra points and home runs. We visualize them running sprints and marathons. We dream of them planting vegetable seeds, riding horses and chopping down trees. We hear their angelic voices singing Christmas carols. We see their palettes smeared with watercolors, and their fingers flying over ivory keys in a concert hall. We are amazed at the grace of their pirouettes. We never never stop believing in all they will accomplish as they pass through this world. This morning Roa had PT with Mary. There was a definite different feel to this session. Roa usually has PM therapy, but we moved it to AM due to his changing nap routine. Mornings are usually slower paced with alot of Mama-snuggle-time. He also has not seen Mary for a few weeks due to the holidays. That all being said. It was a hard session for Roa and I. (Mary, if you are reading this, we can talk about it next week!) As a teacher of special needs prior to being Mom2Roa, I witnessed and helped with many therapy sessions for children. I know kids cry and don't always want to do the work. I know you have to move them through it and get the task done at times. As a parent, now, I look at the therapy through new eyes. Honestly, sometimes it is heart-breaking to listen to Roa cry and reach out to me with his little eyes that say, Get me out of here, Momma, as he is positioned and stretched by the therapists. I understand that the therapist know what they are doing and that the stretching and positions are necessary to help Roa's muscle process new movements. However, I sometimes think that with all the crying, fussing, and pleas for rescue from momma, is his brain really taking it all in and processing the new motor plan expected of him? If the therapy was more child-interest based.... get him playing and involved and then work in the positioning at his comfort level wouldn't he respond better to the session and learn the patterns with more sucess? I've been doing some reading about the Anat Baniel method of therapy for cerebral palsy. Alot of what she does make sense to me. Take a few minutes to check out this short article from Cerebral Palsy Magazine. I would love to hear your opinions, experiences with any therapies in your or your child's life. Should the therapy feel like work to actually "work" Or can it be more child friendly? We are officially cutting back on therapies for Roa. This month, we are taking a break from Courage Center PT sessions. We will continue to take Roa to Independent Swim sessions on our own at Courage 1-2 times a week. It will be nice for Mom to have a break from the drive to Stillwater during this cold wintry month. Roa will continue to have home-based OT, PT, and Craniosacral therapies one day each week. We will also continue to go to ECFE class weekly so Roa can have play time with other kids and teacher time with Pat. Roa has been going into the HBOT chamber 4-5 nights a week with Daddy. Tuesdays and Fridays will be Mom therapy time! I am excited to have a couple days to work with Roa on my own and actually follow through with therapist recommendations. Roa has been eating more solids and eating less from the breast! YEAH! He still prefers purees and is gaggy with solids and textures, but we are moving along! Because of the increase in solids and the bedtime help from Dr. Garcia, sleep specialist, Roa has actually slept THROUGH THE NIGHT 2 nights in a row this past week! YIPPEE! I actually felt sore and achey when I woke up at 4:00am and he was still asleep. I haven't had more than 4 hours in a row for 2 years! We think that Kim's Craniosacral session and the HBOT has also impacted Roa's sleeping in a positive way. Another fun update, Roa is tolerating more time on his tummy and reaching out with his arm while in a tummy time position. This is great for increased neck, head, trunk and arm control. I talked with Laurie, OT and case manager about Roa's evaluation for speech therapy. We are looking at that starting in possibly Feb.
Do you watch Desperate Housewives? If so, did you catch last night's episode? In this episode, the Wives were all dreaming "What If" scenarios about their lives. Lynette, who is pregnant and suffering from an accident that endangered the lives of the twins she is carrying, was told one of the babies may live but have developmental issues. Lynette dreamed of her son at 14 months struggling through therapies, crying during the positioning and stretching, not meeting milestones. Lynette broke down. She talked about all the equipment, injections, and specialists. She questioned if all the therapies sessions were worth it. She cried of fears for his future. She cried of being drained and tired. Wow, did that show hit home. What a wonderful job the writers did of capturing the real fears and emotions a family with special needs face every day. Did they peek through my window? I cried real tears as they went on to show, Patrick- age 10, Lynette's son with the physical disabilty, struggle to make his own sandwich. Lynette stood by and let him struggle on his own. She cried, she shook, she clenched her fingers into the counter, she suffered with him silently. But, she knew it was best to make him to the simple task alone (enormous for Patrick!) to gain independence. I'm glad the popular, mostly silly show gave America a glimpse into my life and the life of many "desparate mothers". By watching this episode, I'm not sure if you can really, truly feel the pain that we feel as we watch our babies fight, but it hopefully will make people start to think.